Counting from preschool, this is my twenty-fifth year of homeschooling. We have three high school graduates and one junior. Back when I started, in the 1990's, resources were significantly less available than they are to today's homeschoolers. For the Children's Sake, The Christian Home School, and The Successful Homeschool Family were some of the first books I read on home education. Together they sparked a vision in me for a different way to educate. I also read many reviews and books by Karen Andreola. She introduced me to Mother Culture and Charlotte Mason's real books based learning. 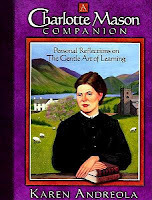 Her book A Charlotte Mason Companion is an excellent introduction to the Charlotte Mason method of homeschooling. Mrs. Andreola was very influential in my life through her writing. She showed me a beautiful picture of what life could be like in A Pocketful of Pinecones. She now writes a blog at Moments with Mother Culture that is so good, I chose it to read from the beginning. Check it out. She's about to publish a new book soon. I spent many hours reading to my children as they were growing up. Recently, my son Michael graduated in our home. We were talking about his growing up years and talking about learning to read. Michael told his younger sister, "You didn't want to learn to read. I told you you'd love to read. I told you you'd love history!" I didn't do everything right, but I raised kids who love to read and know how to learn the things they want to learn. By the way. He made As in his two dual enrollment classes and his older sister made all As in her four college classes this semester. They know how to learn even if their education very formal. Cool. :) Thank you, and I love ya. I am thankful to those who went before me too! What a testament to your vocation of motherhood, my friend!!! I love homeschooling, and wish I would have started sooner. Please know I continue to pray for you, my friend! I also homeschooled my children with the Charlotte Mason method, starting in 1988. All I had was a copy of For the Children's Sake, by Susan Shaeffer Macauley. I love Karen Andreola and highly recommend the back issues of her magazine. A charlotte Mason Companion is an excellent book and the first book I recommend to anyone interested in home-schooling. It gives such a picture of a genuine home education experience. I graduated 5 children using CM methods and they all went on to college. All are doing great out in the "real world". Praise God! I love Karen Andreola's blog. She has a way of making everything simple and beautiful. Laura I hope you are feeling good.